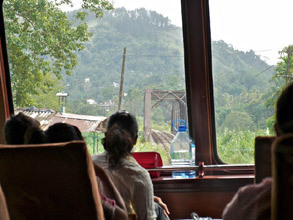 This scenic train ride is the way to reach Kandy, 121 km by rail from Colombo, or the hill station at Nuwara Eliya. 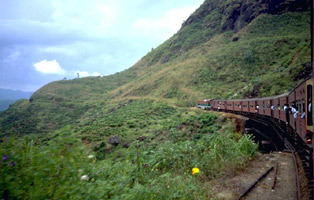 The ride onwards to Badulla, into the hill country, is also wonderful, and probably the best train ride in Sri Lanka. Travel in the 1st class observation car is recommended, and if possible on an InterCity Express train. * This train is the Poki Menike. ** This train is the Udarata Menike. ICE = InterCity Express, with 1st class observation car with reserved seats, 2nd & 3rd class reserved seats. Sleeper = Night Mail, with 1st class sleepers (lockable 2-berth compartments), 2nd & 3rd class reserved sleeperettes (reclining seats), 2nd & 3rd unreserved seats, buffet car. Lux = One or two privately-run luxury 'ExpoRail' air-conditioned carriages are attached to this train, see www.exporail.lk with online booking now available. Service includes at-seat catering & WiFi. 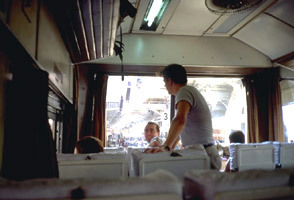 The special fare is around 1,200 rupees one-way (£7 or $11). O = 1st class observation car with reserved seats. 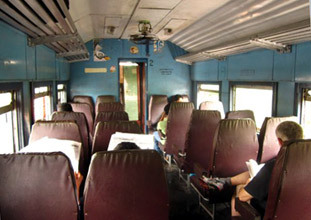 2 = unreserved 2nd class seats. 3 = unreserved 3rd class seats. You can check train times using the official Sri Lanka Railways website, www.railway.gov.lk, but please check all times locally. 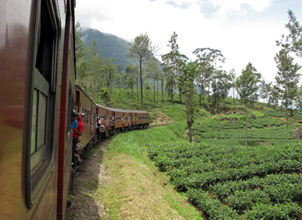 Nuwara Eliya ('City of lights') is a colonial hill station 2,000 metres above sea level, surrounded by tea plantations It's easy to reach by train. The station is Nanu Oya, 6 km from central Nuwara Eliya, with plenty of taxis and auto-rickshaws available. It's also possible to walk. Traveller Graeme Thorley reports "I thought the observation car to Kandy was okay although it requires you to travel backwards (in my case at least) which is not to everyone's taste. It also got incredibly hot (36°C at one point) due to the large window and there were only a limited number of seats that had a really good view. Rather irritatingly on my outbound trip two of these were occupied by people who slept for most of the trip! The other point is that the carriage was occupied almost entirely by Westerners - this might be considered a good thing but personally I felt it left me more remote from the travelling experience. On the train to Anaradhapura several locals stopped to chat, practise their English, exchange complaints about the delays etc. I also bumped into one of the families I had met on the train whilst sightseeing (they recognised me) and we had another chat. I find that sort of thing an important part of travelling." 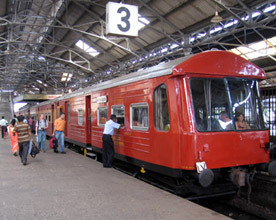 Traveller Paul White reports "Don't panic if you can't get a ticket for the 1st class air conditioned trains to Kandy. 2nd class is more than adequate, but do try & get a window seat. The best side to sit on for scenery is the right hand side as you face forward from Colombo to Kandy, as this will give you the best views once you get past Rambukkana. Do be brave and try the food on the trains! Many vendors will wander up and down selling cold drinks, fruit, spicy snacks and so on at reasonable prices." Also see www.bootsnall.com for a good account of this trip. Above: The 1st class observation car, at the rear of the train, with window looking back along the track. The photos above courtesy of Bill Wood of Massachusetts. A visit to Bill Woods website, www.billwood.com, is highly recommended to see more photos of this journey.